Took me moment toward examine every of the comments, however I really loved the piece of writing. It proved being in actuality cooperative to me plus I am constructive to all the commenters here! It’s usually kind whenever you can not just be informed, but in adding entertained! I am constructive you had pleasant writing this write-up. Odd this put up is totaly unrelated to what I used to be looking google for, but it was once listed at the first page. I guess your doing one thing proper if Google likes you adequate to place you at the first page of a non comparable search. Thank you very much for writing all of the good info! I am looking forward to reading more posts! Thank you so much for writing all of the awesome information! I am looking forward to reading more posts. bicycle lanes are a tremendous problem in my town too... I hope our government can solve these problems quickly. Fabulous video indeed! Thanks a lot for sharing it with us. Excellent video and great points. I live in Tallahassee that has a very scattered network of bike lanes with absolutely no connectivity to get through the city with such infrastructure. 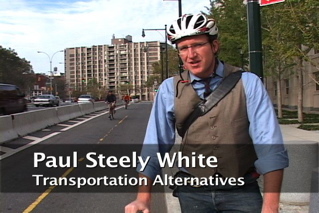 I consider myself an experienced cyclist and have been doing all my commutes by bike for over 2 years now. I cycle (and have to) on all sizes of roads, including ones with bike lanes, sharrows, a mixture of each depending what block you're on, or no infrastructure whatsoever. Cycling next to parked cars is one of my biggest 'fears' as I do not want to get knocked over and crushed by a 10,000 lb vehicle. Fortunately most of our bike lanes are found on streets that people don't want to park on anyway. But there is one street, College Ave, which has lots of frat houses and so the bike lane on it (ironically one of the widest in the city) has rows of cars parked on it 24/7 throughout the year. To me this is WORSE than useless. You're constantly having to navigate in and out of the bike lane. Sure you don't HAVE TO, but when drivers see one, they expect you to stay in one so unless you enjoy getting harassed, then it's a lose-lose situation. In the US there seems to be lots of disagreements about whether it's safer to cross intersections on a shared road or separate infrastructure. I've cycled in Copenhagen and felt safe at all junctions. Why? For one thing there are loads of cyclist at every intersection in the city, even during non-rush hour, so you have the safety in numbers. Because so many people are cyclist drivers really do watch out for you before making right-turns. At trickier intersections, cars are not allowed to turn right while cyclist have the green and vis versa. You can still try and argue that this is not statistically safer (there's a variety of conflicting sources out there) but I and most everyday regular cyclist would agree that it FEELS safer to ride on a segregated facility than sharing with 10,000 + lb vehicles in a culture where many drivers don't like sharing with cyclist. This is precisely why only 1% of Americans make commutes by bike, and most cyclists are recreational ones who drive to the park or trail. What's the use of having a system that is safe if people don't feel SAFE ENOUGH to ever use it? Danish and Dutch (especially) cities pretty much all have excellent facilities and have rates in the 30, 40 or even 50% (Groningen at 57%: http://www.globalideasbank.org/site/bank/idea.php?ideaId=378) range of people commuting by bike. So even if you want to go the stats route, it doesn't speak well for systems that lack GOOD separated infrastructure. On a final note. Intersections are the places of the most frequent conflict, even in Denmark and Netherlands. So? They address these problems rather than question whether their segregated facilities work or not. Check out David Hembrow's website with many examples on how junctions can be properly designed for cyclists in mind. 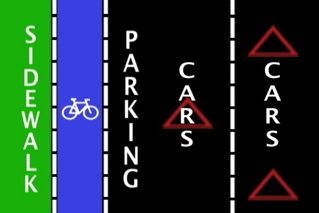 What NOT to do if you want good, segregated bike lanes? Make it very narrow (1 m width), don't mark intersection crossings, give no priorities to cyclist when approaching side streets, make it go nowhere useful to commuters, don't develop a connected network and force cyclist to have to detour or ride on unpleasant stretches of road, have no enforcement when vehicles or other obstacles are placed in the bike lane, etc. TheNorth Face Sale develops quickly and to become a famous company ... .The name of The The North Face Outletcomes from that in theNorth Face Denali Gore Tex JacketsHemisphere,the North Face 3 in 1 Jacketsslope is the ... authentic mountain-climbing amateurs,Fearlessness forever and the tough stuff head on. It makes so much sense. But cities like mine, Adelaide, South Australia, just seem to procrastinate over the idea. In my opinion it's a changes for good because will happened less accidents on the road. Gotta say I agree. Would love to see an update even in San Diego where we have lots of bikers. "Everybody's in a rush and nobody cares. It's every man for himself." Sounds like NYC, alright. Love this article. This information needs to be more readily available, so bikers stay safe everywhere! Not a great idea to have parked cars opening their doors into a bike lane, surely?